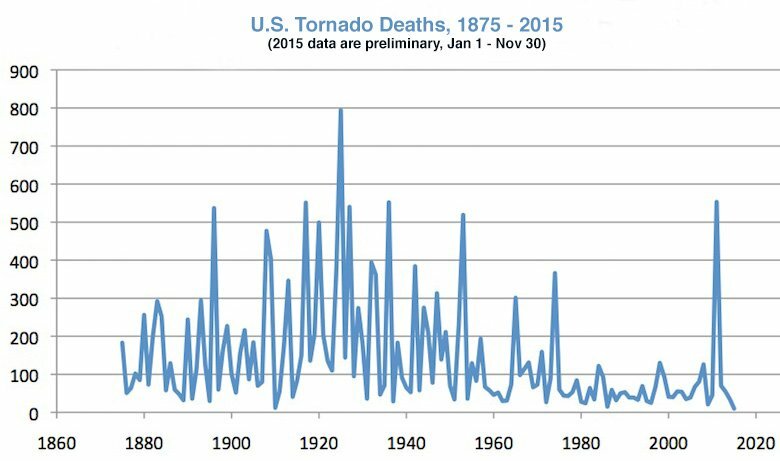 Using statistics compiled back to 1875, Weather Underground’s Bob Henson shows how low this year’s tornado deaths have actually been. “If this number holds through the end of the year, it will beat the 12 deaths reported in 1910 to become the lowest annual total on record,” Henson says. Two sources of statistics were combined to create the long period of record. The National Weather Service’s Storm Prediction Center keeps a file on tornado deaths since 1950. Thomas Grazulis, an author and tornado historian, has combed through archives and old newspapers to create a tornado fatalities database back to 1875.